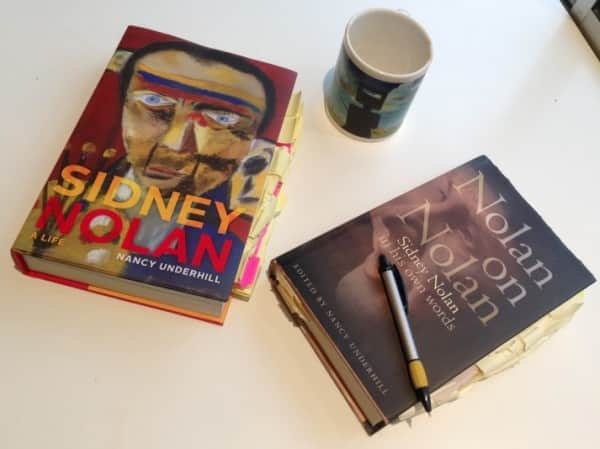 Dr Nancy Underhill’s new Nolan biography Sidney Nolan: a life is very good. The first biography to really look at his life as a whole1 rather than in segments bearing on a particular theme or exhibition, it will become a classic standard text. And deservedly so. Having regard to Sidney Nolan’s much avowed Irishness, I once worked out that he was just two days old on the first anniversary of Ireland’s 1916 Easter Rising. This new biography of Australia’s best known painter went on-line exactly 99 years from the day the last of the Rising leaders were shot by the British. Sidney Nolan: a life reveals to surprised Nolan devotees, long drip-fed Nolan’s Irish ancestry and his policeman grandfather’s pursuit of Ned Kelly, that Sid’s much vaunted Irishness had its roots in Protestant Northern Ireland rather than in the tribal Catholicism of the likes of the Kelly clan. Moreover his grandfather Bill Nolan was not a regular member of the Victorian Police Force, but rather was taken on “especially for duty re Outlaws” and absconded from duty after 18 months – a fact which Underhill sets beside Nolan himself going AWL from the Australian Army in WW2. This Celtic revisionism of Nolan is up front and prominent, indeed it is all of Chapter 2 in this new biography, just released by NewSouth Publishing and to be launched at Heide Museum of Modern Art in Melbourne this weekend. And there are other things about Nolan found here in print for the first time. 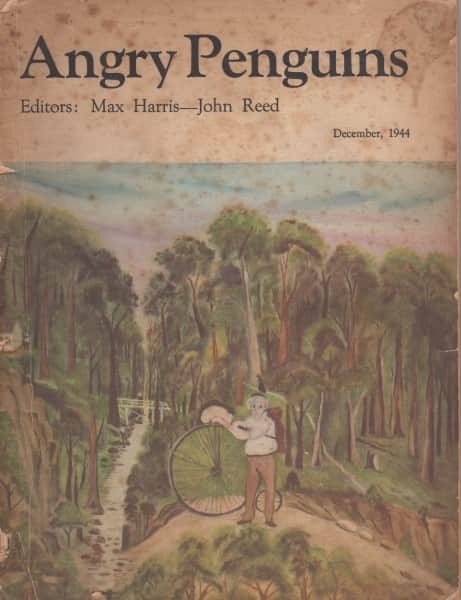 Among them that Nolan probably had a hand, along with Bert Tucker, in what was most likely another hoax hard on the heels of Ern Malley – the “H.D.” or Professor Tipper affair involving naive daubings which surfaced in Melbourne in the mid 1940s and were published in Angry Penguins. Underhill also argues that Nolan’s boss Vernon Jones at Fayrefield Hats, where the artist worked for several years in the 1930s, remains an underestimated influence, as does Nolan’s training there as a commercial artist. “In Australia, insufficient attention was paid to how advertising energised contemporary avant-garde imagery.”2 She compellingly argues how this period influenced him far more than has been acknowledged, and informed much of the “calculated shock” character of the more iconic and landmark works among his early paintings. Aside from the Irish question and the H.D. story, the avid Nolan enthusiast or researcher may find relatively few revelations shedding light on hitherto unknown facets of his life. However the author’s take on the man and his art and on the influences which shaped them, often runs counter to conventional wisdom. Witness for example the influence of his advertising experience mentioned above, the role of friends and patrons like Alistair McAlpine, Elwyn (Jack) Lynn and Stuart Cooper, and the views of his siblings and their families. 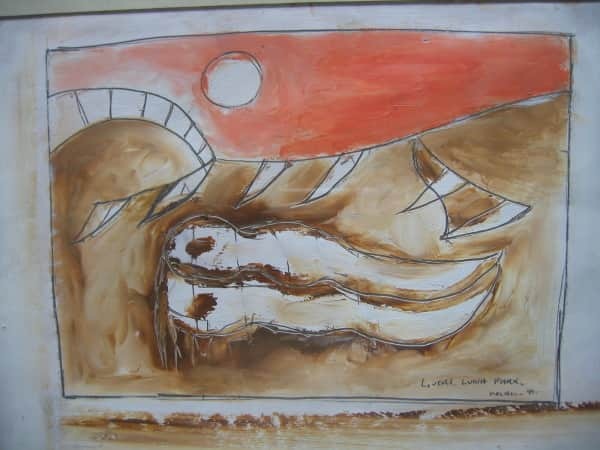 A hitherto unknown source, at least to me, is an unpublished family memoir Sidney Nolan: a brush with life by Nolan’s brother-in-law Laurie Sweet. But what sets the book quite apart from anything previously written about Nolan, is not the depth and scope of the sources relied upon, nor is it the various views as to what or who may have been of greater or lesser influence. Rather it is that in Sidney Nolan: a life, precisely because it sets out to tell the story of a life rather than to focus only on certain aspects or periods of that life, we finally have for Nolan a coherent narrative, without gaps, spanning his 76 years. The book traces the well known story. It tells of his major works, his alter-egos (Ern Malley as much as Ned Kelly), his travels, his loves, his fallings-out – the whole panoply – but often tells it with embellishments that add a human dimension to what hitherto may have been little more than a bare fact. Thus whilst it was known that Nolan and his first wife Elizabeth (Betty) Paterson briefly ran a pie shop in Melbourne’s Lonsdale Street and lived in upstairs digs, we learn here how they were financed into this venture with ₤50 from Sid’s dad (who would only give the money to Betty) and how to parental consternation they simply walked out on the investment when keen on the idea of moving to Sydney – a decision prompted by their 1940 visit when Nolan was commissioned by Serge Lifar to design the set for the Ballets Russes opera Icare. A Montreal friend recently sent the photo below. 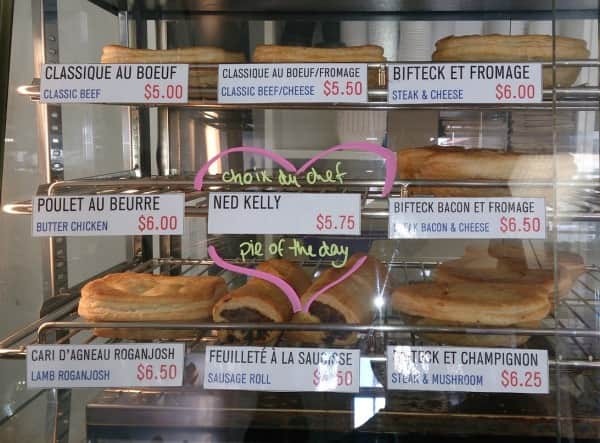 I irreverently imagine that perhaps Ern Malley didn’t return to Sydney in 1942 to die at the same age as Ned Kelly, Keats and as Nolan was then, but rather, mindful of the Sid & Betty Pie Emporium, took the idea with him to Canada and made his fortune selling pies instead of poems! The book will find wide appeal. It strikes a fine balance between the more esoteric analysis expected of an art historian and a down to earthiness which makes it readily accessible to the lay person. No punches are pulled in calling a spade a spade when describing Nolan’s dealings – whether in business or with others. Thus we learn of Vernon Jones summing him up as having “one of those babyfaces and (he) was the biggest bluffer on earth – a liar,”9 and Max Harris’ view that “Nolan’s personality is about as open as death row at Sing Sing. He manages his life as (if) it were a one man MI5. He is not a beautiful person. Although he can suffer sporadic and painful attacks of friendship he gets over them quickly ….”10 And Harris was a friend! Nancy Underhill is well placed to write on Nolan. Apart from having met him several times and convincing him to sell his slate paintings to the Quensland University Museum of Art where she was Director, she collaborated with Barrie Reid (who fell in love with Nolan as a young man)20 in editing the letters of John Reed – lawyer and art patron who with his wife Sunday lived with Nolan in a ménage à trois of sorts at Heide outside Melbourne for several years in the 1940s. Underhill has also compiled Nolan on Nolan, an encyclopaedic gathering of Nolan’s writings and utterings about himself and his work, and which has become a standard text for Nolan researchers since its publication in 2007. Given her belief that “Nolan deserves a more broad-reaching critical biography informed by historical assessments”21 and that the hitherto undue emphasis of the Reed/Heide factor has been at the expense of “above all Nolan’s subsequent life and art making in Sydney and overseas, “22 on first blush it may seem odd that whilst the ten year period between 1938 when Nolan first met John Reed and March 1948 when he married Reed’s sister Cynthia accounts for less than a fifth of his adult life, discussion of this period occupies almost half the pages in the book devoted to his adult life. Given too that Underhill writes “Somehow, at least in Melbourne, Nolan still hovers over Heide despite having lived and painted elsewhere for forty-five years.”23 those who attend this weekend’s book launch at old Heide, where Nolan lived and loved 70 years ago, might be permitted a wry chuckle. But none of this is really surprising. Reverberations from that ten year period would profoundly affect all of them for all of their lives. It is well accepted that the Reeds never got Nolan out of their systems – there is less acceptance that he never quite managed to rid himself of them. The book is well illustrated with 48 mainly colour plates carrying over eighty images, almost fifty of them of Nolan paintings. It is a shame though that two paintings in particular, his 1984 Self Portrait in Youth and his 1942 Wimmera, are not among them. Underhill makes interesting comparisons between the former and his 1943 Self-Portrait, and the latter and his 1942 Landscape. It would have been fascinating to have the visual comparisons alongside the textual. The text is most comprehensive and wide reaching. Its thirty page index has no fewer than 100 references to individual Nolan paintings, 200 references to places and locations, 600 references to individual people, and even more references to subject. It is well edited – indeed in this veritable cornucopia of facts I found but one small, completely inconsequential error of fact. Some few other matters, such as whether Mrs Fraser was originally painted in 1948 or 1947, to which I incline, are matters for interperetation. The convict David Bracewell persists as Bracefell, and contrary to the official record he still rescues Eliza Fraser only to be betrayed – however, as the author correctly points out, this version of events is how Nolan understood the story. Dr Underhill’s book is the type of Nolan biography I once dared to think I might have written. I could never have produced the good result found in Sidney Nolan: a life. Thus it seems rather mean-spirited if not impertinent, to suggest, as I later will, that something more could perhaps have been included. 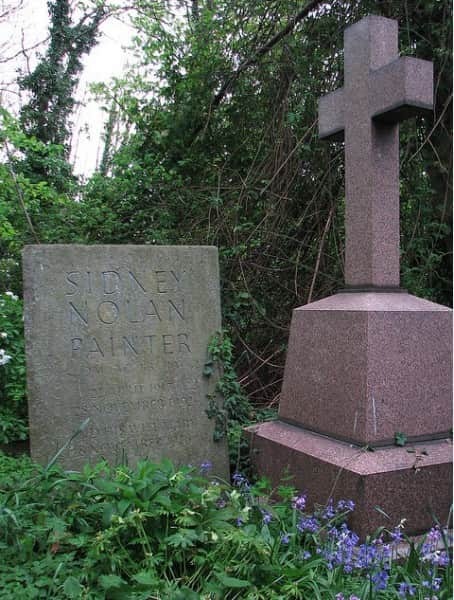 In talking of her approach of seeing the man first and then the paintings, rather than the man through the paintings, Underhill acknowledges that Nolan “made it his business to obscure what made him tick.”25 Today, twenty plus years beyond the grave – his in company with Karl Marx, Anna Mahler, Douglas Adams and Sir Ralph Richardson in London’s Highgate Cemetery – this obscuration by Nolan remains remarkably effective. The book’s subtitle Sidney Nolan: a life is well chosen. 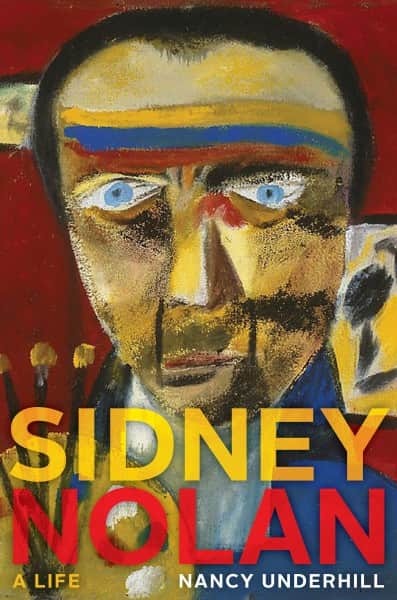 While we have Nolan’s life documented as never before with a biographical account chosen to be “warts and all,” we do not have, at least to quite the same extent, a full picture of Sidney Nolan: a person. A virtual wellspring of latent energy can be seen to underpin many of Nolan’s early landscapes – whether it be the magical splendour in his first Kellys, the lyrical sparse lushness in his first Fraser Island paintings, the surreal vistas of his first Central Australian canvases, or the arid parchings of his drought carcasses. Which brings us to the title of this review. Much of Nolan’s painting had about it a terrible beauty. Much of his life, compellingly set out here in Sidney Nolan: a life, had about it a terrible beauty. But what of the essence of the man …. his soul if you will. Did it have a terrible beauty …. or did it have, perhaps, a terrible torment? And what effect did that have on his oeuvre, on his influence on others, indeed on his life? And Sidney Nolan: a life only partly answers this. The reader however scarcely gets to visit this interior. However, looking at what makes an artist of Nolan’s stature tick need not be emotional voyeurism and can be considered a legitimate avenue of scholarship and enquiry – disguise it though he might. Underhill summarily lays to rest the question whether Nolan and Barrie Reid may have briefly been lovers with the statement “I was told of this in the late 1980s when there was much intrigue about outing people, whether or not they liked it or had the right of reply. I suspect the stories of Nolan were spread after he became famous and therefore carried a certain cachet.” The book continues “a quick scan of future compatriots … (no fewer than 16 are listed) … should let the issue rest. Those who were homosexual had long-standing partners.”33 This non sequitur seems equivalent to concluding his friendships with Reid and Osborne, Britten and Pears, White and Lascaris prove the opposite. As with many things about Nolan, the man’s own words can be the most revealing. Underhill’s 2007 book Nolan on Nolan records his comment, when interviewed at the 1990 Aldeburgh Festival and speaking of his exhibition at Aldeburgh in 1964 of two dozen paintings based on Shakespeare’s sonnets, “that was a very sombre exhibition, and it was all about a personal experience of mine, you know, rather like the Vere, the captain thing.” This reference to the homo-eroticism in Britten’s opera Billy Budd is rather unambiguous. Nolan continues “It was a hidden thing in me which I coudn’t discuss now, but it was a kind of hidden relationship, I suppose, in my life that I never discuss and – but I was able to put it into the sonnets; you know, Shakespeare was exactly it ….”34 And there follows one of those comparatively rare moments in Nolan interviews when his guard drops and he talks from the heart rather than the head. For a biographer to pursue matters such as this is not mere idle curiosity, not salacious tittle tattle, not nudge-nudge wink-winking gossip. Nolan is probably the best known and most influential Australian painter of the 20th century and what made him tick, what made him paint, is legitimately worthy of analysis. There will be a time when a future biographer of Nolan might discuss his Shakespeare Sonnet paintings. Their significance is not discussed here, not hinted at, let alone analysed – they are barely mentioned. If a painter’s oeuvre is to be examined through the prism of a life – as is the author’s stated intent here – what may be crucial aspects impacting that life need to be examined and not easily dismissed. When that time comes, and knowing of Nolan’s life through biographies such as this, we might journey with tomorrow’s writer and discover Nolan the person. We might see for example his Sonnet paintings with new eyes, see in his invocation of Sonnet 71 arguably a self-portrait head cradled against the Simian-like skull; and ponder how it, and all the others, might reveal the person. “I was bushed for forty years. “Australian Artists and Poets Booklets No 9”, published byAustralian Letters, c 1970. 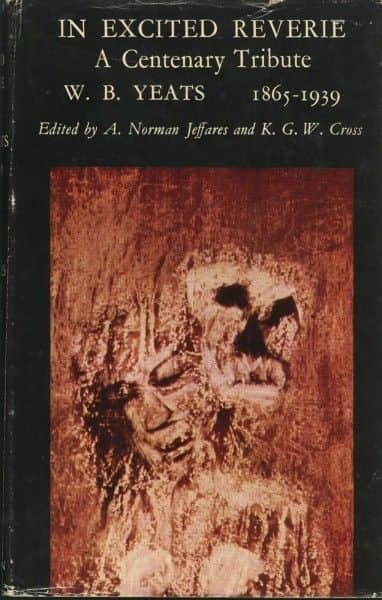 However the book speaks but sparingly of the slings and arrows Nolan directed towards the Reeds in the 1960s and 1970s, and hardly at all of Heide-related demons which beset him, or indeed anything else that may have been the catalyst for his tide of invective. We read that “for Nolan, those Kellys were both his most successful public identity and the focus of private angst directed at the Reeds”40 but it is clear that Underhill understands that more than the Kellys is at play here. Given Nolan’s obsession with the Reeds, and ‘obsession’ is not too strong a word, I wonder whether he ever made the connection that his mother’s stepfather’s name was none other than John Reid.44 He would also have been intrigued to learn, had he lived into the age of the internet, that the website for John Reed, the British poet whose well-known anti-war poem Naming of Parts Nolan almost certainly knew, is www.solearabiantree.com. 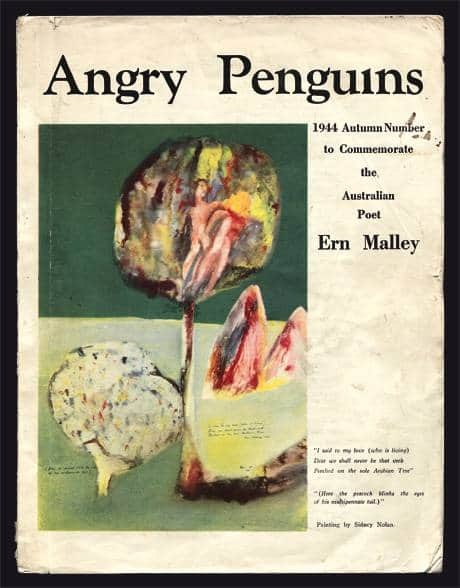 The site takes its name from Nolan’s painting for the Ern Malley edition of Angry Penguins which shows him and Sunday perching verb-like and naked in the sole Arabian tree of Shakespeare’s poem The Phoenix and the Turtle. In this biography we glean little of Nolan’s feelings and thoughts particularly during the late 60s and early 70s. These were years of emotional purging that saw him paint half a dozen Malley portraits in one day; saw the bitter bile of his Paradise Garden poems – unquoted here and barely rating a mention; years which saw his illustrations for McAlpine’s lavish reprint of Ern Malley’s Darkening Ecliptic – illustrations which say far more about his time at Heide, then almost 30 years distant, and far more about the effect it still had on his state of mind, than about Malley’s poems. Indeed it is difficult to get any feeling as to whether there was in Nolan a hint – perhaps more than a hint, and for much of his life I would suggest – of a man of sorrows, and acquainted with grief. “Lovers, Luna Park”, 1941, Sidney Nolan, Private collection. Sunday Reed’s presence for Nolan though, manifested itself quite differently. More bile, less beauty. The last of 48 plates in the book showing Nolan in 1984 on location for the shooting of the Hoyts Edgley film Burke and Wills provides a good example. Nolan used this photo as a model for his 1985 painting Robert Melville at Alice Springs. Mrs Fraser, by now well and truly his Sunday symbol, skulks by to remind all and sundry that she remained a potent presence in his psyche long after he supposedly shed himself of her in 1971 with Paradise Garden and in 1974 with Darkening Ecliptic. left, Nolan on location for shooting of “Burke and Wills”, 1984; right, Sidney Nolan, “Robert Melville at Alice Springs”, 1985. Nancy Underhill’s Sidney Nolan: a life is timely. Just two years short of his centenary, it is a mine of information and will deservedly be well thumbed and equally well footnoted in many a future catalogue essay. Or perhaps it is to some of Nolan’s own words in Underhill’s Nolan on Nolan we can turn for a glimpse of Nolan the person. Of my father’s cart he drove me in. 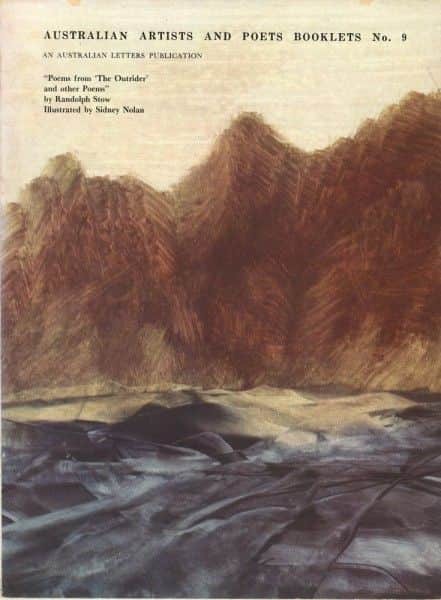 Randolph Stow’s first novel To the Islands, written when he was all of 22, memorably concludes with lines spoken by the ageing Heriot as he looks out over the Arafura Sea to the Aboriginal islands of the dead. ‘My soul,’ he whispered, over the sea-surge, ‘my soul is a strange country.’ I wonder if Stow ever revisited Heriot’s whisper with an ageing Nolan in mind. … Well, they’re all dead, including the dog .. [pause] .. except for .. [pause] .. such a curious feeling isn’t it..
Brian Adam’s biography Such is Life was written several years before Nolan died. Nancy Underhill, Sidney Nolan: a life, NewSouth Publishing, Sydney, 2015, p. 39. Sidney Nolan: a life, p. 1. Sidney Nolan: a life, p. 6. Sidney Nolan: a life, p. 234. Sidney Nolan: a life, p. 279. Sidney Nolan: a life, p. 230. Sidney Nolan: a life, p. 134. Sidney Nolan: a life, p. 39. Sidney Nolan: a life, p. 295. Sidney Nolan: a life, p. 216. Sidney Nolan: a life, p. 229. Sidney Nolan: a life, p. 94. Sidney Nolan: a life, p. 341. Sidney Nolan: a life, p. 241. Sidney Nolan: a life, p. 189. Sidney Nolan: a life, p. xiv. Sidney Nolan: a life, p. 215. Sidney Nolan: a life, p. 318. Barrie Reid interviewed by Ramona Koval. (See Ramona Koval, “A Last Overland Journey,” The Age, Melbourne, 24 July 1995, p. 13. Sidney Nolan: a life, p. xii. Sidney Nolan: a life, p. 97. Sidney Nolan: a life, p. 255. Sidney Nolan: a life, p. 3. Sidney Nolan: a life., p 3. Sidney Nolan: a life, p. 54. Sidney Nolan: a life, p. 210. Sidney Nolan: a life, p. 159. Sidney Nolan: a life, p. 185. Sidney Nolan: a life, p. 187. Sidney Nolan: a life, p. 304. “It is odd that the thrice-married, vigorously heterosexual Nolan, should have made so many of his female figures so asexual.” T. G. Rosenthal, Sidney Nolan, Thames & Hudson, London, 2002, p. 225. Sidney Nolan: a life, p. 55. Nancy Underhill, Nolan on Nolan: Sidney Nolan in his own words, Viking, Melbourne, 2007, p. 358. Sidney Nolan: a life, p 97. Sidney Nolan: a life, p. 98. Sidney Nolan: a life, p. 5. Sidney Nolan: a life, p. 349. Sidney Nolan: a life, p. 331. Sidney Nolan: a life, p. 352. Sidney Nolan: a life, Footnote 9, p. 373. Sidney Nolan: a life, p. 56. Sidney Nolan: a life, p. 307. Sidney Nolan: a life, p. 112. Michael Dugan, letter to David Rainey, 24 March 2005. It is difficult to escape the conclusion that a number of events in Nolan’s life were recurring sources of guilt-laden angst surfacing from time to time. Some seem obvious: leaving his first marriage and young daughter, his desertion from the Army, his brother’s drowning on active service, and Cynthia’s suicide; others less so: his occasional reference to the ‘hidden relationship’ he associated with the Shakespearean Sonnet paintings, his dissatisfaction with a deterioration in his marriage to Cynthia, and his isolation from Australia. These albatrosses of guilt did not fall from Nolan’s neck as they did in Coleridge’s poem with the Ancient Mariner finding redemption on seeing beauty in the creatures from the deep slime moving ‘in tracks of shining white’ with ‘flash of golden fire’ and the Mariner saying ‘a spring of love gushed from my heart, and I blessed them unaware’. If an albatross fell from his neck, it most likely fell at the feet of Sunday Reed. Much of Nolan’s painting is intensely personal, yet tragically the magic of all the light, all the shining white and golden fire he saw in the world, and all the beauty – a light and beauty invested in so many of his paintings – seems never for him to have released the albatross. Just as threads in a tapestry come to the surface only to disappear and reappear, so also the troubling threads in life. It is tempting to think that most of the troubling threads surfacing in Nolan’s life he would trace back to Sunday Reed and in so-doing, time and again re-visit his personal La Belle Dame sans Merci. Nolan on Nolan, p. 447. See Sidney Nolan interviewed by Michael Heyward, London, 5 April 1991 on this website. I was disappointed to find no reference to Nolan’s ‘Shakespeare Sonnets’ series (small chiaroscuro heads in burnt umber) from the mid 60s – further evidence of the artist’s intensely literary inspirations.